My new ekSel COOL Oven, Grill and BBQ Gloves make it much easier for me to take hot pans out of the oven or to remove a hot pot from the stove. 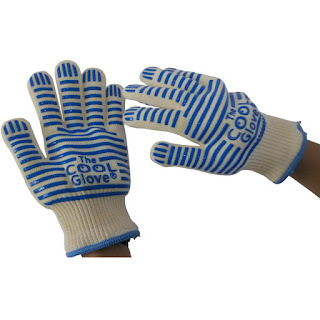 I used to fumble around with bulky oven mitts or potholders, but with these I can move my fingers easily and grab the hot pots and pans with no trouble at all. The grip strips on them assure that you can get a good grip so you won't be dropping a hot pan. I haven't tested them against boiling water or steam because quite frankly, I would imagine that dipping my hand in boiling water would probably not be a good idea. I have had 3rd degree burns on my hands from a boiling water incident years ago, and don't want to go through that pain again, so I will not be testing that (at least not intentionally) with these gloves. I would advise against it though, just to be on the safe side. They do work well for the intended purpose of removing hot pots and pans, or grabbing hot dishes out of the microwave. They also work well for opening stubborn jars because of the silicone gripper strips, and changing light bulbs is no longer a problem. I will be testing them next summer for grilling, although I see no reason why they wouldn't work great. Just don't expose them to the open flames and you should be fine.